I impatiently sit in a small room trying to keep Drake calm while we wait for a specialty veterinarian to see us. Two couples essentially confirmed his diagnosis the moment we walked into the office. “A torn ACL?” I half smile back at them hoping they are wrong. Drake, our 60 lbs. Boxer mix, has a limp leg. Our normal veterinarian forewarned me what came with news of an ACL tear. I pray for different news. A female veterinarian who specializes in surgery enters the room. At this point I am sitting on the floor with Drake. We have not stopped shaking since we left home. We make quite the pair. I do not necessarily fear confirmation of his injury. I fear the cost to return him to his able-bodied self. My husband waits on the other end of the world for news as well. “He has what we call an Anterior Cruciate Ligament (ACL) tear,” the doctor says. I am doing my best to listen and understand as she tells me the options for treatment. Would you just get to the part of telling me what you recommend and the cost? My heart beats faster as the number rolls off her tongue. Her number doubles that of the number our normal veterinarian forewarned me of before coming here. I contemplate the conversation I had with my husband yesterday in anticipation of the decision I knew we would face. My interpretation of the conversation has us on the same page. After a text to him, which included revealing a large four digit number, it became clear we were not. The shaking of my body has returned with new intensity. In a single moment I feel like my husband has become my enemy and we've entered the battle zone. Jesus says “love your enemies” in Matthew 5:44. My husband's words are cruel. But he’s not my enemy . . . he’s my husband. I understand where the anger stems from. We have been here before . . . forced to make a decision to invest thousands of dollars on a pet. I pause and take a deep breath. In that breath I experience the presence of the Holy Spirit within me. He comforts and guides me. With such sudden warmth what else could it be? Who else could it be? 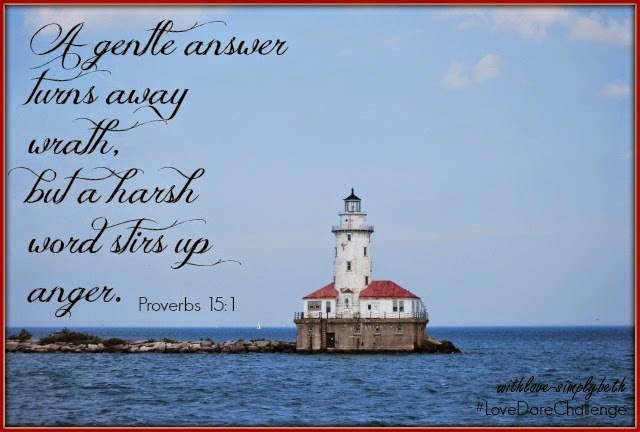 He whispers, “A gentle answer turns away wrath, but a harsh words stirs up anger” (Proverbs 15:1). He brought me wisdom needed to make the next right choice. The text message exchange with my husband comes to an end; not a perfect ending but a peaceful one. I leave Drake in the care of the veterinarian’s assistant after signing our way back into debt again. We had recently celebrated with high-fives through a computer screen freedom from debt. I headed home richer though. Richer for choosing God’s kind of love. For “love is not a fight, but it is always worth fighting for” (pg. 63). An hour later the veterinarian who would perform Drake’s surgery calls me. I will skip over the details and go straight to the good stuff. She called with an offer to reduce the cost of the surgery by nine-hundred dollars. A blessing from God? Oh, yes indeed. Drake is home recovering. More importantly, my relationship with my husband continues to grow deeper and deeper. Because when love steps in, it changes things. p.s. I took a different approach to my writing with this post. Let's call it stretching and exploring where God leads. Hard decisions are always harder with distance. I'm proud of you! I hope everything continues to improve with your precious Drake (isn't it amazing how 'family' our pets are, and how much we need them during deployment??). Blessings on your week! Beth ... you've been so purposeful in walking through The Love Dare ... and I am growing just by following your journey. Your heart-words have been a good, steady guide. Thank you for your vulnerability, for keeping it real. It's like this time apart from your man is being redeemed. Right here in this, your lovely space. How good is God! 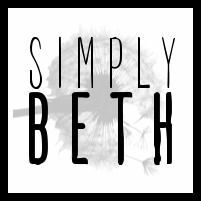 Beth, lovely post! It is amazing how when we follow God's ways, He brings peace both with man & animals. Praying for Duke's recovery. And for your homecoming with Scott. You are a blessing! What a wonderful outcome for your dog and marriage, Beth :)! I'm so glad to hear things worked out and Drake is recuperating. We have put thousands of dollars into our pets as well. It's hard not to. They are so special. Many prayers for you and your family! Thank you, Candace. So glad you were able to link up with us today. Loved seeing you. Thank you for your prayers. Blessings. I love how you let God lead you in the writing of this post. Following His Heart and knowing that He is the Author of our words blessed this post. God teaches me so much in the ordinary moments of my day and using those to try to teach and encourage others gives a connection to many people who at other times might not be touched. I love stopping by here and following your journey! Happy Wednesday! Amazed to see how God responds when we are faithful to follow His lead. I love how you wrote this today!!!!! Following God's lead can feel like such a nebulous thing, and yet this post is a great example of it, both in the writing and in the living of the story. Thanks for sharing what was a stressful decision and how you processed your response. I love it when God does things like that - placing it on the Vet's heart to reduce the cost! How awesome is that? By listening to God and trusting Him, your faith was honored in this! I'm so glad that your dog is on the mend! P.S. I couldn't link up today as my post's title has more than three words! LOL But, I'll be back next week! We don't always receive an instant blessing when we obey - this is a beautiful story of when we do! I hope Drake is recovering well from his surgery. I love what Linda said about this time apart from your husband being redeemed. So encouraging! Have a blessed week, my friend! Oh Beth, I read this with tears in my eyes. I've been here. Once with a beloved dog with cancer, we did the treatments and it turned out well. The next with a horse who had pneumonia and needed IV treatments, a chest tube, and round the clock care. We decided to do this and just as everything was looking bright, and while I was in the stall with her as she recuperated from surgery, she passed. God gives us so many challenges to overcome. This one almost broke me, but then made me seek Him further.We were just learning to trust God during this time. Children, marriage, and animals are all things that have the power to bring us to our knees. And God has the power to do ALL things. So glad Drake is doing so well. Thank you so much for sharing your story, Kim. I had tears in my eyes reading of your horse. Speaks to my heart on how God truly does waste nothing in our life. He will use it all to draw us closer to Him. Thank you again for sharing. Blessings to you. What an awesome testimony to obeying God's ways. Love that your shared your heart so bravely and freely here. Not going to lie... When hubs and I start um, a "discussion," I have to use all of the grace of Jesus to fight fair because my flesh doesn't want fair-- it wants to win. But that isn't how Jesus rolls, huh? Continually soaking in His grace and trying to love (and argue) like Christ. PS: Praise God for reduced vet bills and for Drake to heal ASAP! Love you. I get the struggle to want to win, Sharita. It's a pull and there are still moments when I don't fight fair. Grateful for His grace and that He is never done working in us. And yes, PRAISE GOD! So glad Drake is on the road to recovery. Praising God for grace in relationship and for tendering your vet's heart to lower the cost. Love it!! "Because when love steps in, it changes things." I love this Beth. Thank you. Your Love Dare posts are real and transparent. I can relate to many, including this one. God bless you, friend, as you continue to live out your beautiful life with Him! I'm so sorry, Beth. I messed up link #31. I meant to put "Seeking His Will" rather than my post title. I tried to do it again, but I got an error message. Can you tell I am NEW? :) I'll get it right next time. Love your blog! No worries, Heather. I fixed it for you!! So glad you made your way here. Nice to *meet* you. Blessings. Wow!! And everyone was blessed because of that one small decision to listen to that still, quiet voice within. 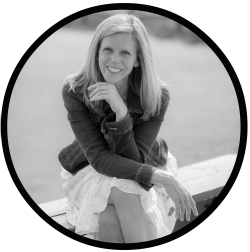 As always, your sweet spirit speaks to my own, but you wrote a very real truth when you mentioned that in one moment our husbands can go from being our hero and partner in the walk to being our enemy. You made the choice to do what I often hear in my head, but don't always do in my choosing... that soft-gentle voice... the soft answer... the turning of wrath. All to often it is much easier to let the wrath spill rather than the gentle spirit-controlled peace to flow. Thank you for the reminder to choose grace, Beth. I love how god rewarded you immediately with the overflow of that peace. Praying for more moments of unexpected blessings as you follow His lead. So special, Beth. I know that these moments are difficult and tense, yet with God in the middle, we are free to be His. Oh, that I would allow Him there always. Thank you for this beautiful post of the real stuff. God's Truth working in real life. I really liked the *style* of this post - and the message was wonderful. Yes, love changes many things, not the least of which is ourselves. I love how God worked in your heart, and in this situation, and how love trumped a heated conversation that could have exploded. May God continue to teach us how and when to speak, and when it's important to keep quiet. What a good path to take. I hope the surgery goes well. I loved this approach, Beth! Both the writing approach & the life style approach! Blessings, friend! Three Word Wednesday: Why the Military?